The narrative of Apple's China problem boiling down to a brutal battle with Tencent (WeChat) or local smartphone manufacturers is inaccurate. Apple's business in China is not imploding. Rather, it is experiencing growing pains. After more than a year of sales declines, positive signs are beginning to reappear in Apple's China business. China continues to represent more of an opportunity than a risk for Apple. Greater China is Apple's third-largest operating segment and consists of Mainland China, Hong Kong, and Taiwan. As shown in Exhibit 1, the segment saw significant revenue growth in 2015 followed by a surprising decline in 2016. With Apple on track to report nearly $45B of Greater China revenue in FY2017, the segment will report its second consecutive annual decline. In 2013, Tim Cook looked at China as being well-positioned to eventually become Apple's top market. At the time, Greater China was Apple's third-largest operating segment, representing approximately 15% of overall revenue. Over the subsequent two years, it looked like Cook's prognostication would be proven correct. After a very strong 2015, Greater China bypassed Europe to become Apple's second largest operating segment, responsible for 25% of overall revenue. Observers soon began to forecast when Greater China would overtake the Americas to become Apple's largest operating segment. As seen in Exhibit 2, the situation changed dramatically in 2016. Weakness in Greater China led to the segment falling back below Europe in terms of revenue. Meanwhile, the Americas firmly remains Apple's largest operating system with revenue nearly double that of Greater China. Apple's declining revenue in Greater China over the past six quarters can be attributed to a slowdown in iPhone sales. As seen in Exhibit 3, iPhone sales share in Mainland China saw a notable tick down beginning in early 2016. The data is courtesy of Kantar Worldpanel, an analytics firm relying on longitudinal surveys to track the same individuals and their smartphone habits over time. 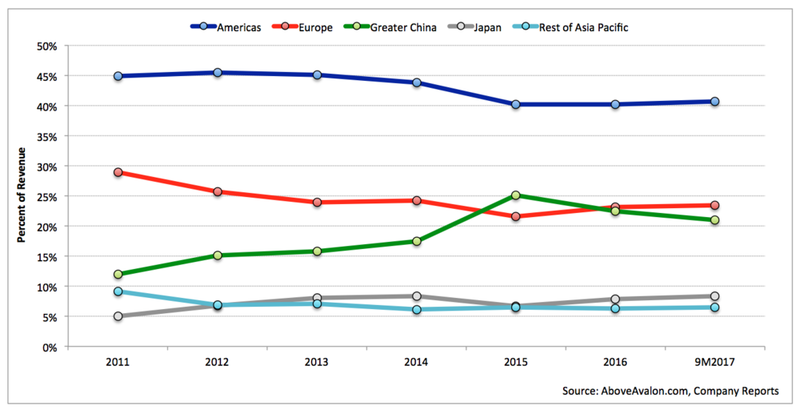 Kantar data provides a decent snapshot of how the iPhone is selling relative to other manufacturers (sales share). The sales share peaks experienced in early 2015 and early 2016 corresponded to new iPhone launches. The most recent iPhone launch (iPhone 7 and 7 Plus) clearly underperformed the two previous iPhone launches. This weakness undoubtedly led to much discussion at Apple HQ as it came as a surprise to management. A number of theories have been put forth in an attempt to explain iPhone sales weakness in China. Ben Thompson over at Stratechery made the case that WeChat's prominence in China has reduced the value and lock-in found with iOS, reducing Apple to "simply another smartphone vendor." According to Thompson, this situation has led to declining loyalty and retention rates among iPhone users. WeChat also seems to have become the consensus pick among western media when it comes to pinpointing Apple's problem in China. Wired's Jeremy Hsu took a slightly different angle, saying Apple was "a victim of its own failure of imagination." The company's failure to adapt services such as Apple Music and Apple Pay to local culture has contributed to fading consumer interest in Apple hardware. Hsu argued Apple Music should have a free tier while Apple Pay's reliance on near-field communication technology isn't appealing in China. While the preceding arguments contain solid points, they ultimately end up being dubious for explaining iPhone sales weakness. Both arguments position weak Apple services adoption, either due to a strengthening WeChat or Apple's own doing, as a sign of shifting customer perceptions facing Apple in China. Poor Apple services adoption is then said to lead to less brand loyalty and greater odds of switching away from iPhone. Such a claim ends up giving way too much credit to the influence Apple services play. It's as if Apple is a services company that just happens to sell hardware. This isn't the case. There is something more at play in China regarding weaker iPhone sales besides greater WeChat competition or lackluster Apple services. 1) Anemic smartphone sales growth. There continues to be a misperception that Mainland China is seeing 20% to 30% smartphone unit sales growth year-over-year. This just isn't the case. In reality, smartphone sales growth is much harder to find. According to IDC, the smartphone market in China grew 3% in 2015, 8% in 2016, and has been struggling to grow in 2017. Apple management likely contributed to the false perception of there being massive smartphone sales growth in the country by constantly talking up the opportunity tied to China's expanding middle class. While this shift is occurring, its impact on overall smartphone growth is less clear. 2) Massive consolidation. Given such anemic sales growth, there has been intense competition and consolidation, especially at the low-end of the smartphone market. In 2014, the "Other" category consisting of Samsung, Lenovo, and a number of smaller smartphone manufacturers, represented 238M smartphone shipments. Two years later, "Other" sales declined by 60M units to 178M smartphones. The big smartphone loser in China hasn't been Apple, but rather Samsung and smaller smartphone manufacturers. Meanwhile, Oppo has experienced the strongest increase in smartphone sales on an absolute basis in China with Vivo and Huawei coming in second and third, respectively. On a combined basis, Oppo, Vivo, and Huawei saw an increase of 130M smartphone unit sales from 2014 to 2016. While it may be easy to look at Oppo, Vivo, and Huawei as winning at the hands of Apple, in reality, their sales gains have likely come from Samsung, Lenovo, and new customers entering the smartphone market at the low-end. Despite a very difficult 2016, Apple was still able to grow annual iPhone shipments by 8M between 2014 and 2016. This goes to show just how strong the iPhone performed in 2015. 3) ASP Divergence. The smartphone pricing gap in China is expanding. While Apple sits at the premium end of the market with an iPhone average selling price (ASP) exceeding $700, every other major smartphone manufacturer is reporting ASP that is a fraction of iPhone's. Pricing data would support the theory that Apple and those smartphone manufacturers with the strongest sales momentum are appealing to completely different customers. While overall smartphone growth remains subdued, whatever growth there is can be found at the low-end of the market. Taking into account the unique trends found in the China smartphone market, my theory is that there are actually four distinct issues impacting Apple in China. 1) Lack of New Users. It is becoming that much harder for Apple to find pockets of premium users in China ready to buy their first iPhone. Apple's smartphone sales share in China peaked in 2015 right after China Mobile began selling the iPhone 6 and 6 Plus. While China Mobile had officially begun selling iPhone a year earlier, it was the iPhone 6 and 6 Plus that represented the first big iPhone launch for the carrier. Apple experienced a big iPhone sales boost from the iPhone 6 and 6 Plus launching into an untapped reservoir of premium China Mobile users. Once these users purchased iPhones, there weren't similarly-sized pockets of new users elsewhere in China. Instead, Apple had to turn to Android switchers for new users. This is one reason why new users as a percent of overall iPhone sales has been on the decline. 2) Longer iPhone Upgrade Cycle. Considering how Apple saw a significant number of new iPhone users in China in 2015, these users were not ready for an upgrade in 2016 or even early 2017 for that matter. Instead, iPhone users in China are likely holding onto their iPhones for a longer period of time before upgrading. This trend is not unique to China but rather has occurred in various geographies. 3) Pricing Pressure. The significant smartphone pricing gap in China has placed a ceiling on Apple's iPhone target market. It looks like the number of Android users switching to iPhone is on the decline. According to Apple, switching outside of China was up year-over-year. The implication is that switching in China was down year-over-year. A similar dynamic does not exist in the U.S. where iPhone is actually priced at or below the Android competition. A better comparison for measuring iPhone sales share performance in China would be countries where the iPhone is similarly priced at a premium. As seen in Exhibit 4, in what may come as a surprise, iPhones sales share in these countries end up even worse than that of China. 4) Growing Pains. Although Apple has made much progress opening new Retail stores in China, the company still has an inadequate retail footprint in the country. There are only 40 Apple Retail stores in China, a country with 1.4 billion people. To put that number in context, Apple has seven retail stores in Connecticut, home to a little more than three million people. Brick and mortar retail matters in China. According to Kantar, nearly 90% of Oppo smartphone sales took place through brick and mortar. Apple just doesn't have the retail penetration in Tier 1, 2, and 3 cities in China. For example, Apple has only three stores in Chongqing, one of the largest municipalities in China with a population of 30 million people. While consumers have the option of buying Apple products through carriers or third-party retailers, there are drawbacks found with Apple relying on others to sell product. Despite selling the iPhone for years, iPhone sales share at Verizon remains lackluster compared to that at AT&T, Apple's initial partner in the country. Many have speculated that this lower sales share is due to the way smartphones are sold at Verizon where sales clerks have sway over consumer purchasing decisions. Apple Retail stores represent one of the best ways for management to push the Apple experience. This is something not possible with third-party retailers. Considering it took management two years to open 20 stores in China, the lack of Apple Retail stores is an issue that will take Apple years to fix. Apple's main issues in China are related to the underlying structure of the smartphone market, not greater WeChat competition. Why then is WeChat positioned as Apple's arch nemesis in China? If users spend all of their time and attention within the WeChat ecosystem, is Apple's ecosystem negatively impacted? Is WeChat cultivating a user base that views Apple as simply a premium-priced hardware provider, which will then result in less consistent hardware sales? Unfortunately, quite a bit of the analysis regarding Apple and WeChat relies exclusively on anecdotal evidence. In an effort to move beyond this, we can use WeChat's most recent disclosures to gain a better perspective. The company disclosed that half of its 900M monthly active users spend 90 minutes a day on a WeChat property. That is a significant amount of time which likely makes Mark Zuckerberg and Evan Spiegel quite envious. WeChat is seeing success on a scale that simply isn't seen elsewhere by any other services company. However, we use our smartphones for more than 90 minutes a day. Current estimates peg average smartphone usage at five hours per day. This means the average WeChat user, while heavily invested in WeChat, is still relying on other services besides WeChat. Meanwhile, App Annie recently pegged Chinese smartphone users as relying on ten apps on a daily basis. In terms of monthly usage, that number rises to 30 apps. Even if we assume these estimates are being generous, the narrative that WeChat users only use WeChat is exaggerated. The WeChat topic raises a broader question: What is Apple actually selling in China? iOS? Services? Hardware? Apple is selling the same thing in China as it does in every other country. Apple is selling an experience. The simple act of buying an iPhone, even if it is used for WeChat, is part of that Apple experience. While Apple management would certainly like to see customers using Apple services, in reality, Apple service usage is not a requirement for Apple to succeed in a market. Instead, services are meant to add even more value to Apple hardware. At the same time, Apple service usage doesn't necessarily lead to increased loyalty and retention. Instead, the dynamic is much more complicated. For example, Apple loyalty is doing just fine in the U.S. even though Apple Pay usage remains surprisingly low. Signs of a bottoming process are appearing for Apple in Greater China. Revenue trends are stabilizing. During Apple's 3Q17 earnings conference call (my complete review of Apple's 3Q17 earnings is available for members here), management commented that although Hong Kong sales were still down, revenue trends in Mainland China were actually flat year-over-year. Revenue trends have now been improving for the past two quarters. While Apple is clearly not out of danger, the Greater China operating segment appears to have found some stabilization. iPhone sales share is improving. As seen in Exhibit 3, iPhone sales share has now seen two months of improvement in Mainland China. 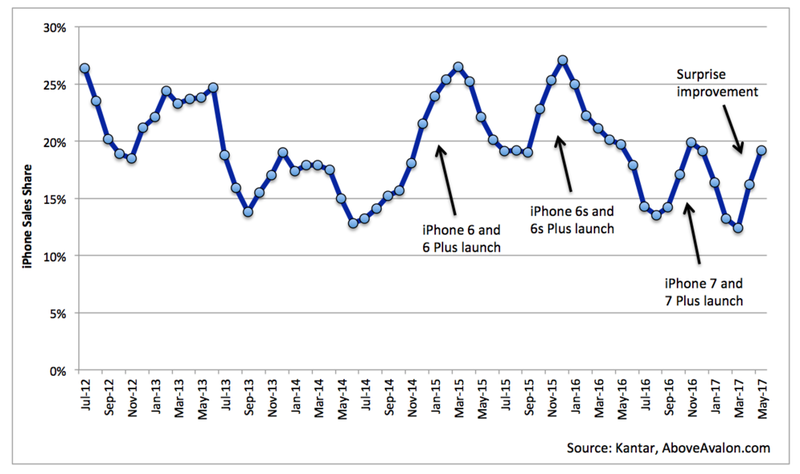 For this to occur in the period leading up to Apple's largest iPhone release in years is actually remarkable. There are two possible explanations for this improvement: the Product Red iPhone 7 and 7 Plus and a natural bottoming process in which existing iPhone users are ready for an upgrade. Broader Apple ecosystem strength. Judging from Apple management commentary, Apple is seeing solid sales growth through its App Store in China. In addition, the iPad and Mac continue to sell well. Apple Retail store traffic and sales are up year-over-year as well. This sure doesn't look like a company seeing its opportunity in China slip away due to WeChat attacking the iOS ecosystem. Apple made a notable leadership change. Apple recently promoted Isabel Ge Mahe to the newly created role of vice president and managing director of Greater China, reporting to Tim Cook and Jeff Williams. While the move was an acknowledgement of issues and trouble in Greater China, it is reasonable to expect greater operating efficiency, including additional effort to localize products. One question regarding Greater China is whether the operating segment still represents an opportunity for Apple or if it is more appropriate to look at the segment as a risk. Is the $45 billion of annual revenue from the region more likely to decline over time or can Apple be confident in looking at that total as a base for future growth? Continue fine-tuning products to better fit local culture. There is pretty much no downside to spending additional resources on this effort. New iOS features targeting China (QR Code support, SMS fraud prevention, etc.) are a clear sign that management looks at this fine-tuning as crucial. Embark on a massive Retail store expansion in Mainland China. A strong case can be made that Apple should have hundreds of retail stores located throughout China. Continue strengthening relationships with key partners, including Foxconn and Tencent. With future China government regulations representing an unknown, Apple's best strategy for handling the geopolitical environment is to strengthen its relationship with local companies, including Foxconn. Contrary to popular belief, Tencent is more of a partner than enemy for Apple. Remain steadfast on taking a long-term view on China. Apple should focus not on turning around quarterly iPhone sales by releasing a cheap iPhone, but instead on forming a foundation for the Apple brand in the country. Apple ends up being graded on a curve in China. Apple is on track to report $45B of revenue in Greater China in 2017. Meanwhile, some of Apple's peers in the U.S. may never see much revenue at all from China. While Apple has its fair share of issues to overcome in China, fundamentals appear to be intact. Apple's ultimate goal in China is similar to its goal in every other country: Sell tools that are capable of improving people's lives. Apple is going to be just fine in China, even if customers use WeChat to enhance their Apple tools.